Currently available on eBay (item 150649693523) is this image of a man on Wilson, which originally ran in the Times in 1971. There were long scratches on his neck and face. The upper lid of his right eye was swollen and bluish. He hadn't shaved for at least two days. 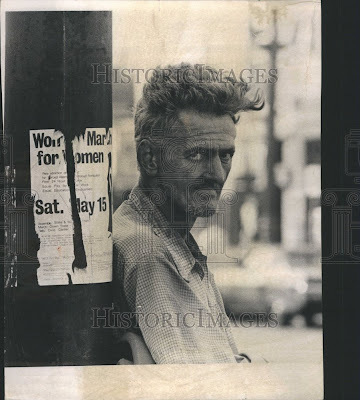 Harold Pixler was sitting in the Wilson Ave. apartment house doorway staring into the street. His white shirt was black around the collar and cuffs. There was a rip in the left knee of his black pants. His shoes were falling apart. He was not wearing socks. On the other side of the street, just west of the firehouse, three men were standing outside a tavern passing a wine bottle back and forth. None of them was dressed any better than Harold Pixler. A few doors down the street, lounging in front of a day-labor center, stood a black man with crutches and a cast on his left leg and a white man with his left arm heavily bandaged. This is Uptown. When you come right down to it, this is what Uptown is all about for so many of the Appalachian whites, Indians, and Puerto Ricans who are trapped here. Their only hope for jobs is in the day labor pools that provide barely enough in salary to pay for room and board. The work is hard and uninteresting. But leisure time in the bars along Wilson Ave. isn't any more interesting.